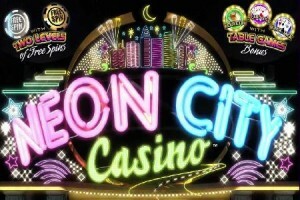 Incredible Technologies has released a new slots game, Neon City Casino, designed to celebrate all things related to casinos and gambling. Incredible Technologies has launched its latest slot, Neon City Casino, which thanks to three bonus games feels like a night out at a Vegas casino. It is a 5 reel, 45 payline slot which unsurprisingly features symbols which are all related to casinos. On the reels players will see slot machines, piles of cash, buckets of coins, casino dealers, drink servers, feathered dancers, a pair of dice, a cashier, stacks of chips, a jackpot symbol, a wild symbol and a free spin symbol. The slot features numerous bonus games, including a 7 card stud bonus game, a roulette bonus game and a blackjack bonus game. The bonus games are triggered by spinning three of the same table game bonus symbols on an active payline. Spinning three of the “Free Spin” casino chip symbols will reward players with 8 free spins. However, during free spins if players land special gold free spin symbols on reels 1, 3 and 5 then they receive an additional 6 free spins. This slot has certainly been designed with the casino fan in mind. Thanks to its three bonus games, playing it is almost like spending an evening wondering around a casino from table to table and game to game.